The multiple Git Build Data links is a known issue; possibly a bug in the Git plugin, needs to be investigated. In general if a plugin was expecting something it ran to only ever be called once per build, but from a workflow it is potentially called multiple times, then it needs to be modified to make sure it does not call Run.addAction multiple times on the same build with the same class of action unless this is really intentional (for example if each instance has a distinctive displayName). If you see duplicated sidebar links of another kind, better to file a separate issue, with steps to reproduce if possible. Jesse Glick added a comment - 2015-07-21 15:25 The multiple Git Build Data links is a known issue; possibly a bug in the Git plugin, needs to be investigated. In general if a plugin was expecting something it ran to only ever be called once per build, but from a workflow it is potentially called multiple times, then it needs to be modified to make sure it does not call Run.addAction multiple times on the same build with the same class of action unless this is really intentional (for example if each instance has a distinctive displayName ). If you see duplicated sidebar links of another kind, better to file a separate issue, with steps to reproduce if possible. Reverting, I had this where I wanted it. Jesse Glick added a comment - 2015-09-08 19:25 Reverting, I had this where I wanted it. Particularly ugly with multibranch projects, which always check out the same repository multiple times. Jesse Glick added a comment - 2015-09-21 20:40 Particularly ugly with multibranch projects, which always check out the same repository multiple times. This turned out to be pretty simple - the git plugin blindly adds BuildData, GitTagAction and changelogs every time you call checkout, even if you've, for some reason, already checked out that particular repo/hash before. https://github.com/jenkinsci/git-plugin/pull/372 adds equals methods to BuildData and Build, and decides whether to actually call build.addAction for the BuildData and GitTagAction later in the checkout, by comparing to existing BuildData already on the build, if any - it also skips GitTagAction and changelogs if it's already processed this BuildData. Andrew Bayer added a comment - 2015-12-10 22:34 This turned out to be pretty simple - the git plugin blindly adds BuildData , GitTagAction and changelogs every time you call checkout , even if you've, for some reason, already checked out that particular repo/hash before. https://github.com/jenkinsci/git-plugin/pull/372 adds equals methods to BuildData and Build , and decides whether to actually call build.addAction for the BuildData and GitTagAction later in the checkout , by comparing to existing BuildData already on the build , if any - it also skips GitTagAction and changelogs if it's already processed this BuildData . What about the BuildData that comes when using "Workflow from SCM", can that be taken out? The only relevant build data and changes are those of the project itself, not those of the Workflow from SCM. Martin d'Anjou added a comment - 2015-12-11 00:06 What about the BuildData that comes when using "Workflow from SCM", can that be taken out? The only relevant build data and changes are those of the project itself, not those of the Workflow from SCM. If the workflow from scm is coming from a different repo/hash than the rest of the project, it'll still show up, albeit only once. Any repo/hash combo that gets checked out will show up once and only once, no matter how many times it's checked out. Andrew Bayer added a comment - 2015-12-11 13:27 If the workflow from scm is coming from a different repo/hash than the rest of the project, it'll still show up, albeit only once. Any repo/hash combo that gets checked out will show up once and only once, no matter how many times it's checked out. So there is another aspect to this - with my fix, you don't get duplicate BuildData added to the build, but if you have multiple repos checked out during the build, the "Git Build Data" links are all actually the same link, which makes sense. The build page shows the multiple BuildData actions, but .../(job)/(build number)/git is just the first one. I'm honestly not sure the right way to make those distinct, though - something involving getUrlName for sure. Andrew Bayer added a comment - 2015-12-11 14:02 So there is another aspect to this - with my fix, you don't get duplicate BuildData added to the build, but if you have multiple repos checked out during the build, the "Git Build Data" links are all actually the same link, which makes sense. 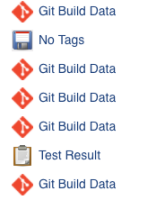 The build page shows the multiple BuildData actions, but .../(job)/(build number)/git is just the first one. I'm honestly not sure the right way to make those distinct, though - something involving getUrlName for sure. I changed my mind a little bit. I think it is useful to see if the "Workflow from SCM" Git repo has changed, but for the users, they need to be able to tell which BuildData is which, and which change list is which. See the attachment for JENKINS-29840. I think showing the "human part" name of the repo URL is a step in the right direction. Martin d'Anjou added a comment - 2015-12-11 14:27 I changed my mind a little bit. I think it is useful to see if the "Workflow from SCM" Git repo has changed, but for the users, they need to be able to tell which BuildData is which, and which change list is which. See the attachment for JENKINS-29840 . I think showing the "human part" name of the repo URL is a step in the right direction. Note, btw, that the de-duplication is only done in checkout - if you add a BuildData from somewhere else (i.e., like the ghprb plugin does), that'll get added regardless, though if you add it before checkout and it's a duplicate of the BuildData that gets generated there, the new one won't be added. Andrew Bayer added a comment - 2015-12-11 14:33 Note, btw, that the de-duplication is only done in checkout - if you add a BuildData from somewhere else (i.e., like the ghprb plugin does), that'll get added regardless, though if you add it before checkout and it's a duplicate of the BuildData that gets generated there, the new one won't be added. Martin d'Anjou - sounds like that merits a separate JIRA to improve the UI aspects of multiple BuildData on a single build. That'd involve my comment above in re: the links for legit multiple BuildData still being the same. Andrew Bayer added a comment - 2015-12-11 14:35 Martin d'Anjou - sounds like that merits a separate JIRA to improve the UI aspects of multiple BuildData on a single build. That'd involve my comment above in re: the links for legit multiple BuildData still being the same. That separate Jira, is it already JENKINS-29840? JENKINS-29840: identify the repos shown on the Build page (BuildData and SHA1 list in the centre of the page). But Jesse Glick closed it as a duplicate of this issue. Martin d'Anjou added a comment - 2015-12-11 15:12 sounds like that merits a separate JIRA to improve the UI aspects of multiple BuildData on a single build That separate Jira, is it already JENKINS-29840 ? This issue: deal with duplication JENKINS-29840 : identify the repos shown on the Build page ( BuildData and SHA1 list in the centre of the page). But Jesse Glick closed it as a duplicate of this issue. Andrew Bayer added a comment - 2015-12-11 15:15 Yup - reopened it. The strange fix of JENKINS-30985 could probably be reverted once WorkflowJob.getSCMs is fixed to remove duplicates. Jesse Glick added a comment - 2015-12-15 15:54 The strange fix of JENKINS-30985 could probably be reverted once WorkflowJob.getSCMs is fixed to remove duplicates. released, at which point we'll need to bump the git plugin version as well. SCM/JIRA link daemon added a comment - 2015-12-16 14:18 Code changed in jenkins User: Andrew Bayer Path: aggregator/src/test/java/org/jenkinsci/plugins/workflow/steps/scm/GitStepTest.java http://jenkins-ci.org/commit/workflow-plugin/2ff48824c9be593441339bda3d402136e2a73831 Log: Test for JENKINS-29326 . Marked as @Ignore until https://github.com/jenkinsci/git-plugin/pull/372 is merged and released, at which point we'll need to bump the git plugin version as well. [FIXED JENKINS-29326] Don't add duplicate BuildData. action and changelog, so that we avoid duplicate records of all these things. SCM/JIRA link daemon added a comment - 2015-12-16 14:19 Code changed in jenkins User: Andrew Bayer Path: src/main/java/hudson/plugins/git/GitSCM.java src/main/java/hudson/plugins/git/util/Build.java src/main/java/hudson/plugins/git/util/BuildData.java http://jenkins-ci.org/commit/git-plugin/b4a4c7d63106ea1b7989d579f99e60ceef0271af Log: [FIXED JENKINS-29326] Don't add duplicate BuildData. Added equals methods to BuildData and Build, and check if we already have an equivalent BuildData on a build before we add it, the git tag action and changelog, so that we avoid duplicate records of all these things. JENKINS-29326 JENKINS-31153 Noting #271 and #296. SCM/JIRA link daemon added a comment - 2016-01-15 22:44 Code changed in jenkins User: Jesse Glick Path: CHANGES.md http://jenkins-ci.org/commit/workflow-plugin/2f2efded09b9c81e3d04186dc5ac4cb8710b9290 Log: JENKINS-29326 JENKINS-31153 Noting #271 and #296. JENKINS-29326 Updated git plugin (and dependencies) to pick up fix. SCM/JIRA link daemon added a comment - 2016-01-19 01:46 Code changed in jenkins User: Jesse Glick Path: demo/plugins.txt http://jenkins-ci.org/commit/workflow-plugin/a93596909db6b3b6a9aa6c1c0b07ba012e2f3873 Log: JENKINS-29326 Updated git plugin (and dependencies) to pick up fix. So, weirdly, I've now stumbled into a case where this still happens - git 2.4.1, pipeline 1.13, https://ci.jenkins-ci.org/job/tmp-jenkins-20-jenkinsfile/5/. There are only two BuildData entries in the build's build.xml, but four links are showing up on the sidebar. So...weird? Andrew Bayer added a comment - 2016-01-20 19:21 So, weirdly, I've now stumbled into a case where this still happens - git 2.4.1, pipeline 1.13, https://ci.jenkins-ci.org/job/tmp-jenkins-20-jenkinsfile/5/ . There are only two BuildData entries in the build's build.xml , but four links are showing up on the sidebar. So...weird? And I should mention that it legitimately should have 2 BuildData, but no more than that. Andrew Bayer added a comment - 2016-01-20 19:32 And I should mention that it legitimately should have 2 BuildData , but no more than that. Ah-ha! With the embeddable build status plugin, this duplicates, without, it doesn't. Seems to be JENKINS-28642 (in this case, but could be another plugin) causing it.transientActions in WorkflowRun/sidePanel.jelly to barf leading to duplicate actions being put in the sidebar. Martin d'Anjou, I know you're seeing this still - do you see any stacktraces in jenkins.log when you load an offending build page? And Jesse Glick, any ideas for a workaround? Andrew Bayer added a comment - 2016-01-20 19:47 Ah-ha! With the embeddable build status plugin, this duplicates, without, it doesn't. Seems to be JENKINS-28642 (in this case, but could be another plugin) causing it.transientActions in WorkflowRun/sidePanel.jelly to barf leading to duplicate actions being put in the sidebar. Martin d'Anjou , I know you're seeing this still - do you see any stacktraces in jenkins.log when you load an offending build page? And Jesse Glick , any ideas for a workaround? Confirmed that with embeddable build status 1.9-SNAPSHOT (after the fix for JENKINS-28642 went in), I don't see duplicate actions any more. Andrew Bayer added a comment - 2016-01-20 20:01 Confirmed that with embeddable build status 1.9-SNAPSHOT (after the fix for JENKINS-28642 went in), I don't see duplicate actions any more. Yes indeed I see a stacktrace when I visit a page with a duplicate build data in the left side menu, and it has it.transientActions in it. See the jenkins.log file attached. I am running Jenkins 1.625.2, Pipeline 1.13, Git Plugin 2.4.1, Embeddable build status 1.8. Martin d'Anjou added a comment - 2016-01-20 21:32 - edited Yes indeed I see a stacktrace when I visit a page with a duplicate build data in the left side menu, and it has it.transientActions in it. See the jenkins.log file attached. I am running Jenkins 1.625.2, Pipeline 1.13, Git Plugin 2.4.1, Embeddable build status 1.8. The fix got broken again in 2.4.2. Jesse Glick added a comment - 2016-03-22 20:46 The fix got broken again in 2.4.2.